Guardians of the Galaxy is shaping up to be one of the biggest movies this summer, and with anticipation growing by the day, we have a brand new clip featuring Star-Lord (Chris Pratt) and Gamora (Zoe Saldana). 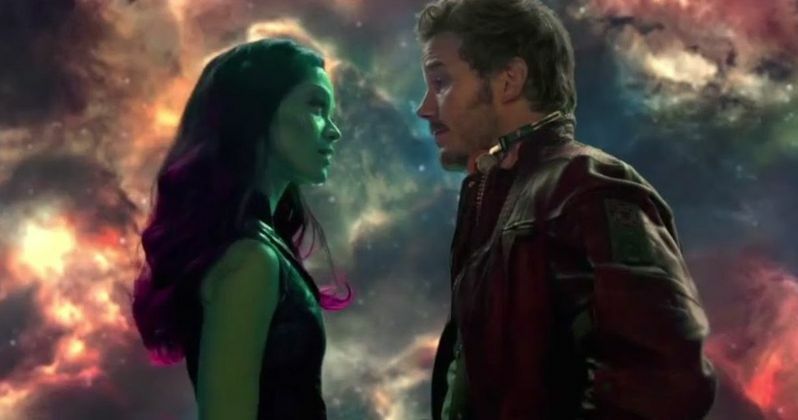 A child of the 80s, before he was taken from Earth by Yondu (Michael Rooker), Star-Lord makes a number of 80s references throughout the movie, including this scene where he tries to coerce Gamora into dancing with him. When she reveals that she is a warrior and an assassin who does not dance, Star-Lord tells her the legend of Kevin Bacon's Footloose, although this seduction technique does not go as smoothly as planned. In addition, John C. Reilly brought another "clip" to the Late Show with David Letterman, although it isn't quite what you might expect. We also have two more set photos from director James Gunn's Instagram account, one with the filmmaker and Karen Gillan (Nebula), and another featuring the director flanked by the Ravagers, including Yondu (Michael Rooker) and Kraglin (Sean Gunn). Marvel's Guardians of the Galaxy expands the Marvel Cinematic Universe into the cosmos, where brash adventurer Peter Quill finds himself the object of an unrelenting bounty hunt after stealing a mysterious orb coveted by Ronan, a powerful villain with ambitions that threaten the entire universe. To evade the ever-persistent Ronan, Quill is forced into an uneasy truce with a quartet of disparate misfits-Rocket, a gun-toting raccoon, Groot, a tree-like humanoid, the deadly and enigmatic Gamora and the revenge-driven Drax the Destroyer. But when Peter discovers the true power of the orb and the menace it poses to the cosmos, he must do his best to rally his ragtag rivals for a last, desperate stand - with the galaxy's fate in the balance.